, a celebrated comic poet, was the son of Philip, and probably an Athenian by birth; but his place of nativity has been contested, his enemies endeavouring to represent him as a stranger. He was contemporary with Plato, Socrates, and Euripides; and most of his plays were written during the Peloponnesian war. His imagination was warm and lively, and his genius particularly turned to raillery: he had also great spirit and resolution, and was a declared enemy to slavery, and to all those who wanted to oppress their country. When the Athenians suffered themselves in his time to be governed by men who had no other view than to make themselves masters of the commonwealth, Aristophanes exposed their artifices with great wit and severity upon the stage. Cleo was the first whom he attacked, in his comedy of the “Equites:” and when none of the comedians would venture to personate a man of his great authority, Aristophanes played the character himself; and with so much success, that the Athenians obliged Cleo to pay a fine of five talents, which were given to the poet. This freedom of his likewise was so well received by the Athenians, that they cast handfuls of flowers upon his head, and carried him through the city in triumph with the greatest acclamation. They made also a public decree, that he should be honoured with a crown of the sacred olive-tree in the citadel, which was the greatest honour that could be paid to a citizen. He described the affairs of the Athenians in so exact a manner, that his comedies are a faithful history of that people. For this reason, when Dionysius king of Syracuse desired to learn the state and language of Athens, Plato sent him the plays of Aristophanes, telling him these were the best representation thereof. He wrote above 50 comedies, but there are only 11 extant which are perfect; these are ``Plutus, the Clouds, the Frogs, Equites, the Acharnenses, the Wasps, Peace, the Birds, the Ecclesiazusae or Female Orators, the Thesmophoriazusae or | Priestesses of Ceres, and Lysistrata.’‘ The ``Clouds,’‘ which he wrote in ridicule of Socrates, is the most celebrated of all his comedies: Socrates had a contempt for the comic poets, and never went to see their plays, except when Alcibiades or Critias obliged him to go thither. He was shocked at the licentiousness of the old comedy; and as he was a man of piety, probity, candour, and wisdom, could not bear that the characters of his fellow-citizens should be insulted and abused. This contempt which he expressed to the comic poets, was the ground of their aversion to him, and the motive of Aristophanes’s writing the “Clouds” against him. Madam Dacier tells us, she was so much charmed with this performance, that after she had translated it, and read it over 200 times, it did not become tedious; and that the pleasure she received from it was so exquisite, as to make her forget all the contempt and indignation which Aristophanes deserved, for employing his wit to ruin a man, who was wisdom itself, and the greatest ornament of the city of Athens. Aristophanes having conceived some aversion to the poet Euripides, satirizes him in several of his plays, particularly in his “Frogs” and his “Thesmophoriazusae.” He wrote his “Peace” in the 10th year of the Peloponnesian war, when a treaty for 50 years was concluded between the Athenians and the Lacedaemonians, though it continued but seven. 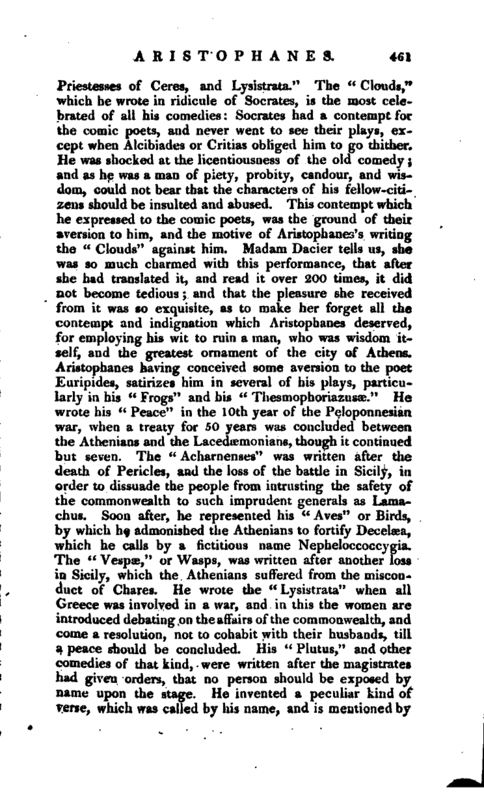 The “Acharnenses” was written after the death of Pericles, and the loss of the battle in Sicily, in order to dissuade the people from intrusting the safety of the commonwealth to such imprudent generals as Lamachus. Soon after, he represented his “Aves” or Birds, by which he admonished the Athenians to fortify Decelaea, which he calls by a fictitious name Nepheloccoccygia. The “Vespae,” or Wasps, was written after another loss in Sicily, which the Athenians suffered from the misconduct of Chares. He wrote the “Lysistrata” when all Greece was involved in a war, and in this the women are introduced debating on the affairs of the commonwealth, and come a resolution, not to cohabit with their husbands, ’till a peace should be concluded. His “Plutus,” and other comedies of that kind, were written after the magistrates had given orders, that no person should be exposed by name upon the stage. He invented a peculiar kind of verse, which was called by his name, and is mentioned by | Cicero in his “Brutus;” and Suidas says, that he also was the inventor of the tetrameter and octameter verse. 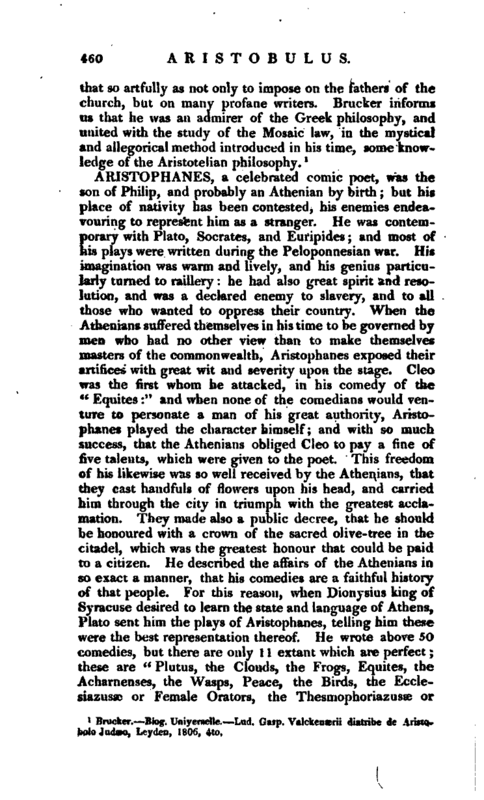 Aristophanes was greatly admired among the ancients, especially for the true attic elegance of his style: “It is,” says madam Dacier, “as agreeable as his wit; for besides its purity, force, and sweetness, it has a certain harmony, which sounds extremely pleasant to the ear: when he has occasion to use the common ordinary style, he does it without using any expression that is base and vulgar; and when he has a mind to express himself loftily, in his highest flight he is never obscure.” ``Let no man,‘‘ says Scaliger, ``pretend to understand the Attic dialect, who has not read Aristophanes: in him are to be found all the Attic ornaments, which made St. Chrysostom so much admire him, that he always laid him under his pillow when he went to bed.’’ Mr. Frischlin observes, that Plautus has a great affinity to Aristophanes in his manner of writing, and has imitated him in many parts of his plays. 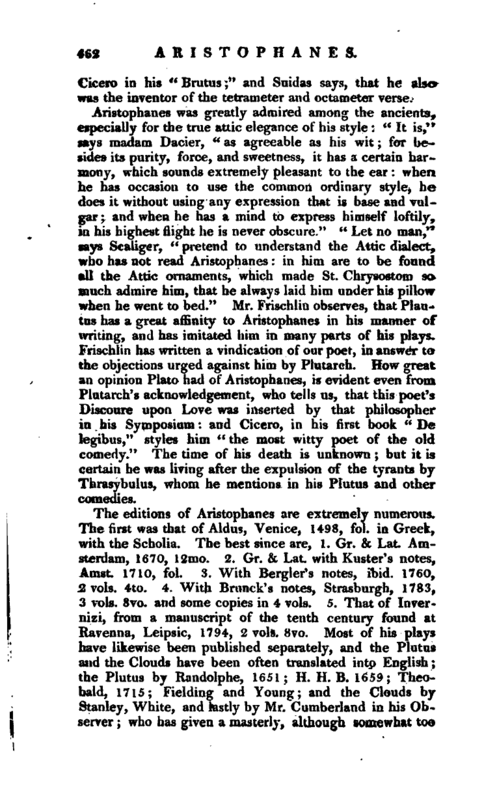 Frischlin has written a vindication of our poet, in answer to the objections urged against him by Plutarch. 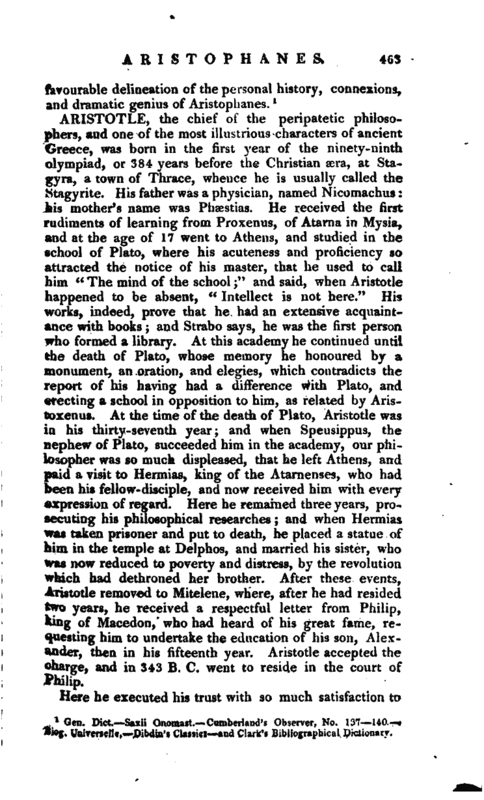 How great an opinion Plato had of Aristophanes, is evident even from Plutarch’s acknowledgement, who tells us, that this poet’s Discoure upon Love was inserted by that philosopher in his Symposium: and Cicero, in his first book “De legibus,” styles him “the most witty poet of the old comedy.” The time of his death is unknown; but it is certain he was living after the expulsion of the tyrants by Thrasybulus, whom he mentions in his Plutus and other comedies. Gen. Dict. —Saxii Onomast. Cumberland’s Observer, No. 137 140 Biog. Universelle. Dibdin’s Classics and Clark’s Bibliographical Dictionary.